As has been well publicised there are going to be changes to the Rules of Golf with effect from 1st January 2019 - Happy New Year! The changes introduced by golf's world governing bodies - the R&A and USGA - result from their Rules Modernisation Initiative (which began in 2012!) to bring the rules up to date to fit the needs of the game today globally, while preserving golf's essential principles and character. The R&A and USGA websites as well as the England Golf and CONGU sites, boast a mass on information on the history of the process undertaken to reach this point, the new rules themselves and explanations as to why they have been made. Using the links provided at the side of this page you can read about all matters appertaining to the changes and familiarise yourself with what you need to know from the start of next month. You will have access to a number of resources including general explanations, diagrams, videos and quizzes all aimed at assisting you with what you need to know. In the coming weeks the R&A will also launch a revamped Rules Academy feature where you will have the opportunity to try and gain an official R&A certificate by taking the online Level 1 Exam at the end of the course. Club have been provided with free copies of the Players Edition of the Rules of Golf but additional copies are available (also free) through the R&A. Also available free are an A5 sized guide (for Committees and Referees) and Modified Rules for Golfers with Disabilities. 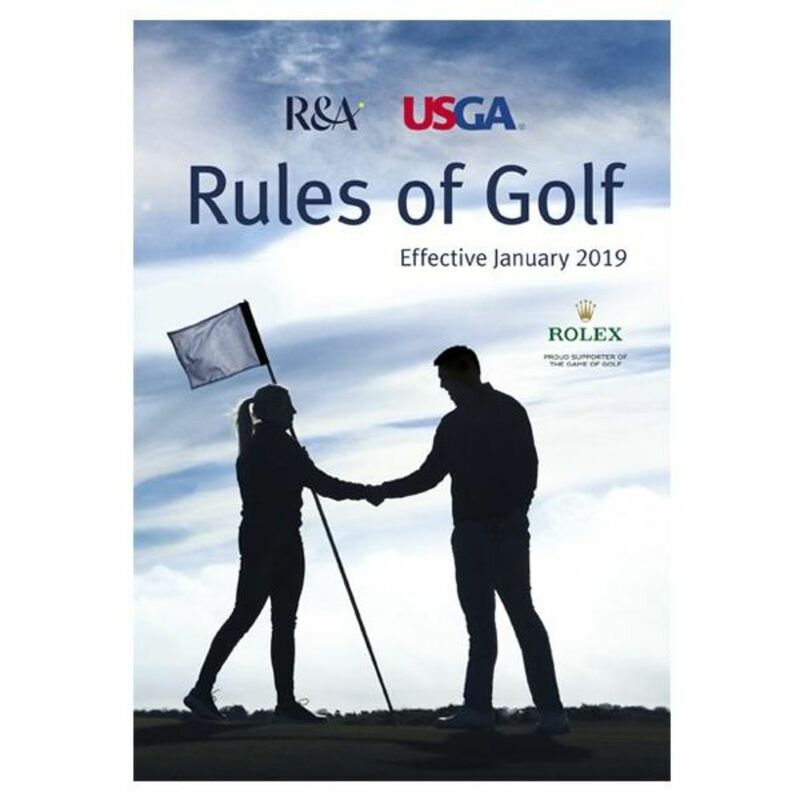 An Official Guide to the Rules of Golf designed as a reference book for those involved in the administration of golf at all levels of the game is available at a cost. If you want further advice I will do my best to help but the new rules are a learning curve for all of us. However if I cannot answer your question, I know someone who can! 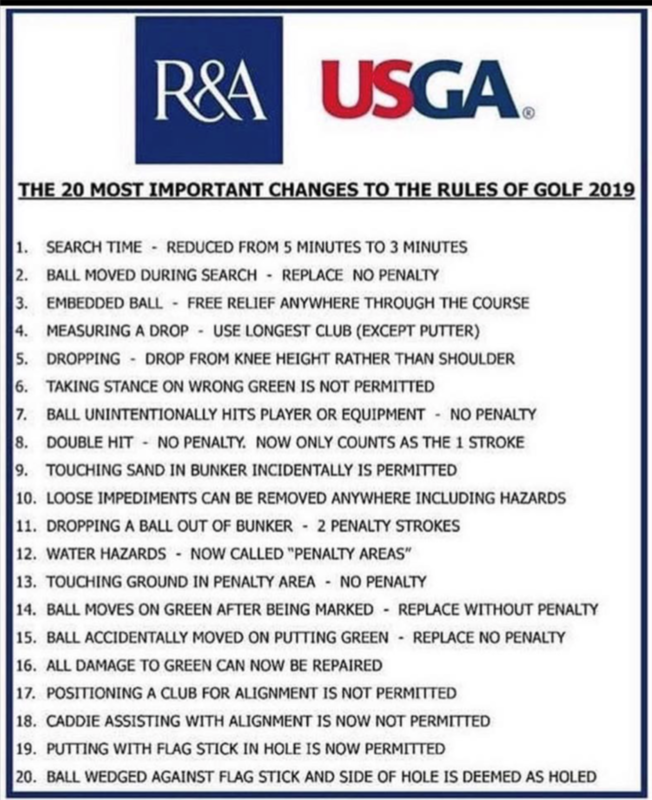 Meanwhile the image below lists the 20 most importany changes to the Rules of Golf 2019. However please do read more than just the headline change - Go on delve in you know you want to!